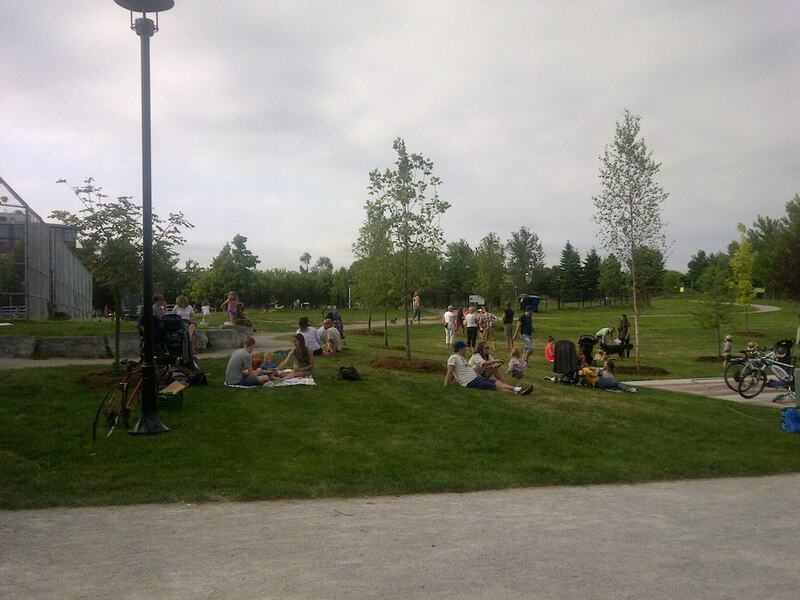 The new Sorauren Park Town Square is a perfect venue for family-friendly concerts, festivals, markets, and celebrations. It can also be used for filming. 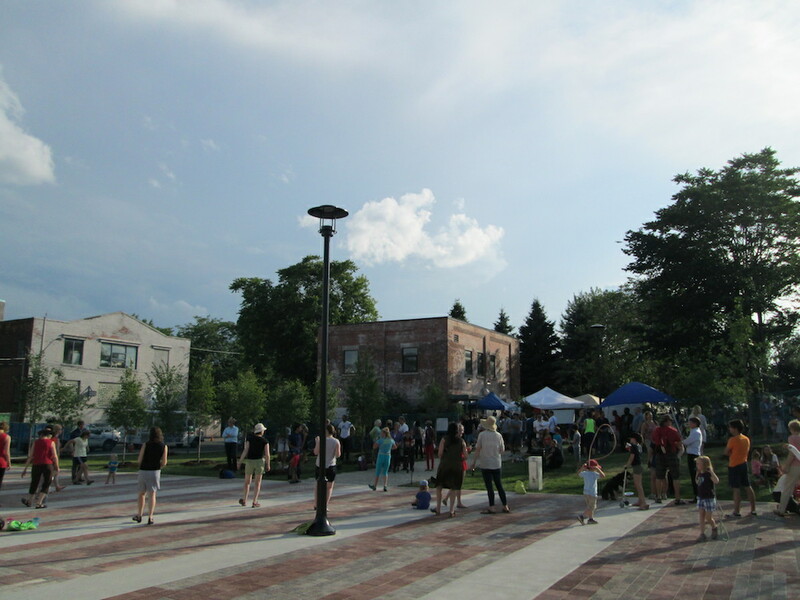 The Square features a hard-surface area (permeable pavers and concrete ribbons) of approximately 70 feet by 90 feet surrounded mostly by green lawn and young trees. The lawn on the north side slopes gently upwards, forming a natural amphitheatre. The Square is also powered with two event bollards offering eight 110V electrical outlets in each bollard. The Square lies between the Sorauren Park Fieldhouse on the west and the future community centre on the east… the old linseed oil mill that is currently fenced off. The Square itself is the site of the former flaxseed elevators that fed the mill from the rail spurs that came up Wabash Avenue. 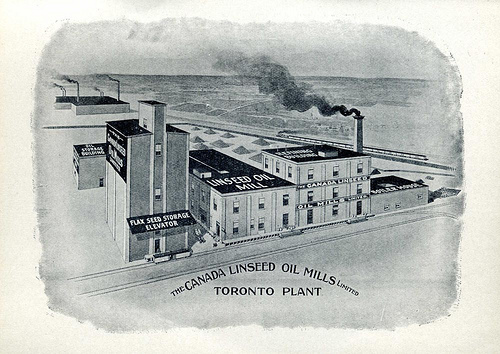 Illustration showing the linseed (flax) mill on Wabash Avenue, looking north. The Sorauren Town Square occupies the space where the tall flax seed elevators once stood. The mill still stands and is the site of the future Wabash Community Centre. 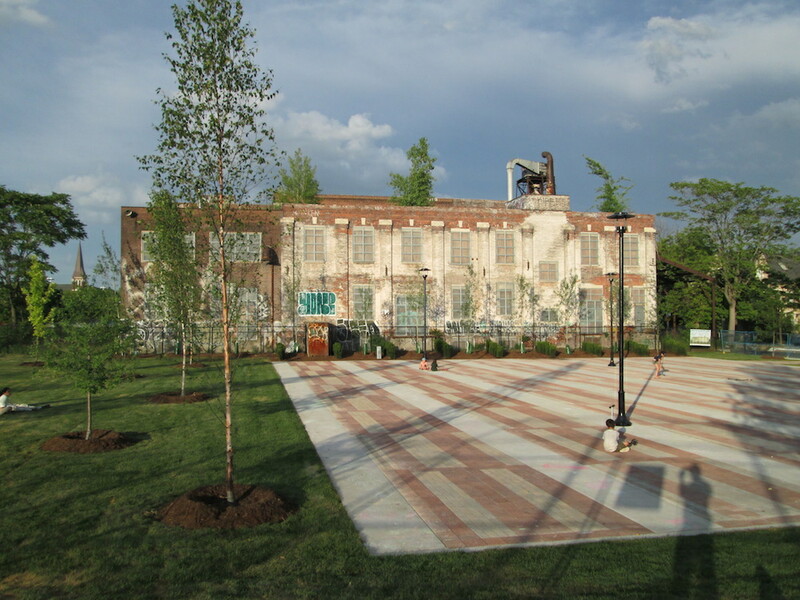 At night, the Town Square is lit with four primary lamp standards with LED lights giving a gentle, warm glow on the warm-coloured pavers that reflect the natural brick colours of the surrounding former industrial buildings. The Sorauren Fieldhouse offers indoor meeting space, washrooms and a small community kitchen. It must be permitted separately if your event would like to use both the Square and the Fieldhouse. 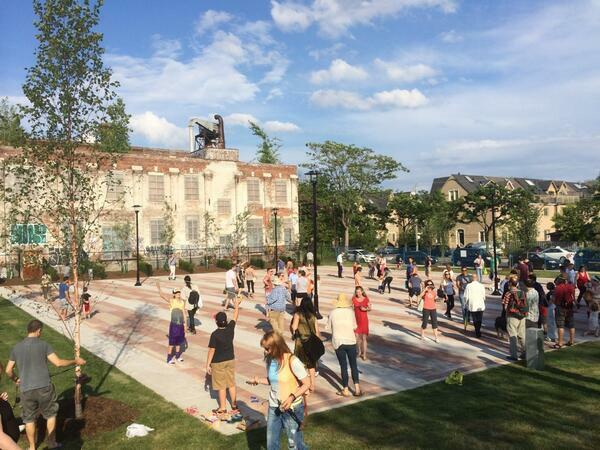 Outdoor Special Events: for non-profit and community organizations holding events that are open to the public. Rates start at $79.58 and up, based on the numbers of expected attendees. Social Gathering: Includes events such as family gatherings and company picnics with more than 25 attendees. Note: Depending on your event, you may also need additional permits for music amplification, temporary food service, security, etc. Apply well in advance! The district permit office can help you determine what you need and costs. Town Square looking west toward Sorauren Park Fieldhouse. Farmers Market runs every Monday 3 – 7 p.m.